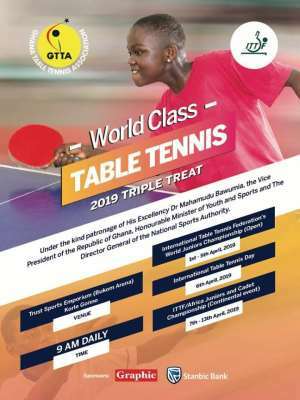 Mr. Mawuko Afadzinu, President of the Ghana Table Tennis Association (GTTA) says his Association is ready to make Ghana proud, as hosts of the upcoming 2019 World and Africa table tennis championships in the country. The two World Championships; the ITTF World Junior Circuit (WJC) tournament and African Youth, Junior and Cadet Championships (AYJCC), would take place at the Trust Sports Emporium TSEL (Bukom Boxing Arena) in Accra, from Monday April 1 to Friday April 5 and Sunday April 7 to Saturday April 13, respectively. Ghana has been handed the mantle to host two major International Table Tennis Federation (ITTF) tournaments in April, which would coincide with the International Table Tennis Day to be celebrated in Ghana on April 6 before the AYJCC begins on the following day. Mr. Afadzinu told the media ahead of both competitions that the Local Organising Committee (LOC) for both competitions have put the necessary measures in place to ensure the success of the competition. He said over 20 countries have confirmed their participation in the tournament to be held in Ghana. "Our hope is to deliver a tournament that will make the country proud, a tournament that would inspire a whole generation of players. We want to make those who will be visiting Ghana worthy ambassadors of Ghana and leave here with high praise for the country," he said. "The LOC has put in place all the necessary arrangements for all participating countries to feel comfortable." He said the government of Ghana had shown immense commitment towards the success of the tournament, adding that, the Association was grateful to the government. He noted that the tournament would give more local tennis players the needed exposure for future events, because as many of them as possible would get the opportunity to play. He said the primary focus was to make sure that a lot of the junior athletes play in the tournament and would also seize the opportunity to build interest in the sport across the country. The WJC is one of the ITTF junior circuits, where players across the globe amass points to qualify for the end-of-the-year World Junior Finals, while the AYJCC is Africa’s qualifiers for the World Junior Championship as well as a platform to select African team for the World Cadet Challenge. Ghana last hosted a major event in table tennis in 2004, when the nation hosted the African Junior and Cadet Championships.